Remember three weeks ago or so when the Dolphins revealed their new uniforms? Well we're evaluating them now. If I had to describe the new Miami uniforms in one word it would be "white." 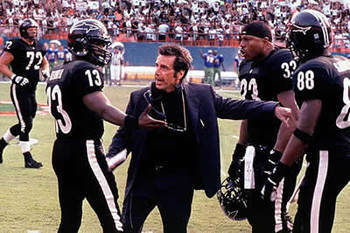 The white road uniforms appear in almost all the publicity shots for the new outfits, and they're kind of boring, almost like a bizarro world version of the Sharks from Any Given Sunday. Very plain, very little color, and very little significance to the design. In fact, the design really didn't change all that much. Nike seems to have just taken last year's uniform and removed most of the stuff on it, including most of the orange color. That's odd, considering that the first thing the designer talks about when it comes to this uniform is the color, of all things. "Yeah, the colors are awesome, but we wanted less of them," he seems to be saying. Mixed messages. This is most noticeable on the helmet, where instead of an orange stripe down the middle, there's just aqua, navy, and a smidgen of orange. Overall, I'm not too impressed with the new look. The whites will probably look alright in the sun, but it's a pretty "meh" design altogether. In my mind, it's the third best of the three new sets this offseason.